Q: I’ve never heard of an FPS/RTS switch in a game before. How does the switch work? A: Switching between FPS/RTS is not a common thing in games since it’s not easy to develop, and usually doesn’t “hit the spot” for gamers. 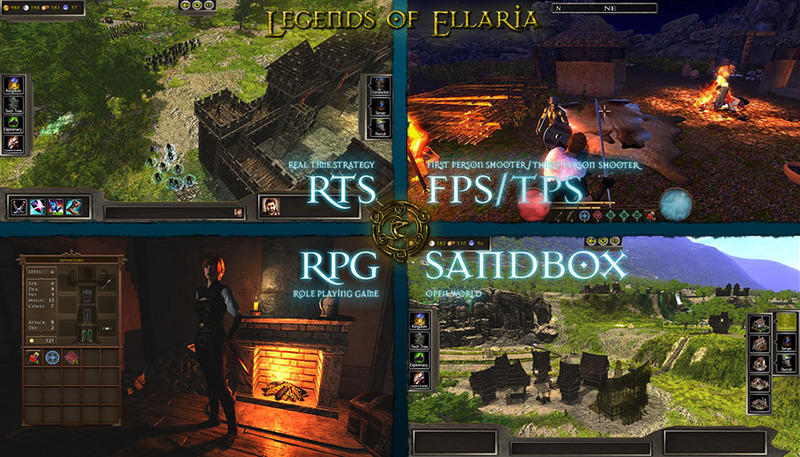 Legends of Ellaria’s switch, however, is simple and not mandatory for players. The switch is designed to be easy to understand and utilize; you press a button in First Person Shooter mode and after a short fade in you have an overlook of the area in Real Time Strategy mode. In Real Time Strategy mode you can command your armies, give construction orders, etc. After you’re done giving commands, this same button brings you right back to first person. The switch is only limited in certain quest areas and players can freely choose to focus one or the other based on playstyle. Q: But I don’t like to manage anything. I want to go on quests, find riches, and fight monsters. Can I? A: You absolutely can. We have many monsters and riches in Legends of Ellaria for you to find, and you won’t have to manage a thing. Players have the option to command their advisor to manage and expand their kingdom via automated AI. You will still see new cities popping up and your economy growing without having to control it manually, and in the meantime you can adventure all you’d like. Q: Actually, I like management and hate dangerous missions…do I need to fight anyone alone? A: Of course not! You are a ruler, aren’t you? Much like many rulers in history, you won’t have to get into any danger first hand that you don’t want to in Legends of Ellaria. From the relative safety of your own palace, send your soldiers to explore and conquer dangerous lands, construct your buildings, and do all the things you’d much rather be managing than performing. You can play the whole game this way if you’d like. Q: What are “special” quest areas? A: These areas are uncharted entrances to hidden areas like caves and ruins. There are many potential riches to be found in places like this…but beware, they also contain challenges. Don’t say we didn’t warn you.